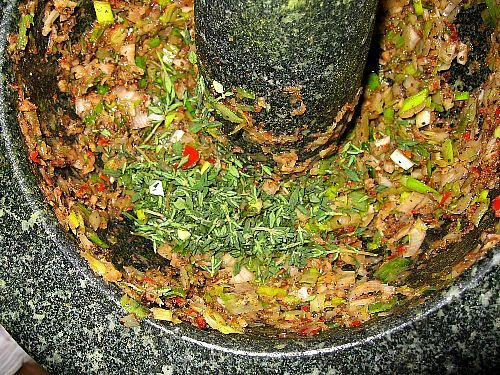 Cooking meat in the tandoor requires a strong marinade that precooks the meat through it acid contents or ferments. 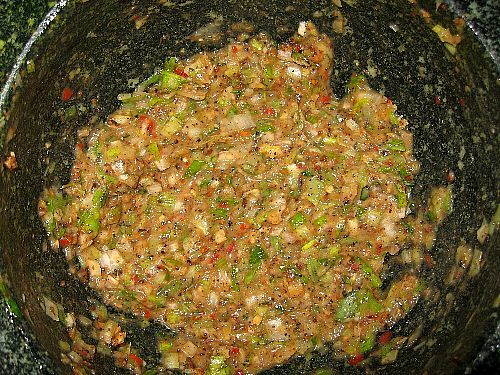 Jerk marinade, the most famous dish of Jamaica, is also the strongest marinade I've ever come across. This makes for a perfect match. First prepare the spices. 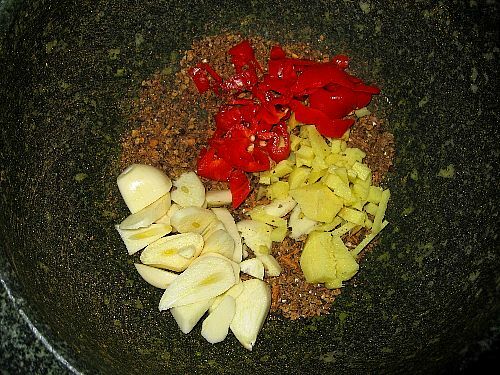 Jerk uses a large amount of allspice as well as pepper and cinammon. You can also put a laurel leaf or a clove. 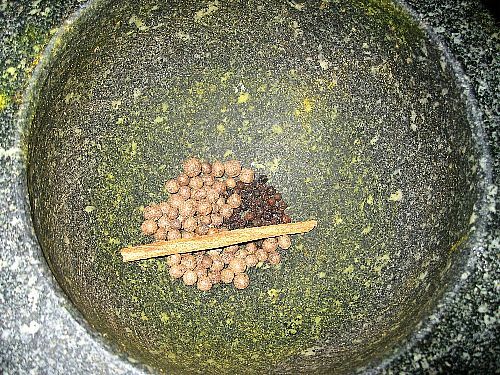 Grind the spices to a fine powder (picture), then add roughly chopped fresh garlic, ginger and scotch bonet peppers. Here I used only one pepper since they are so hot, but in Jamaica they use much more. 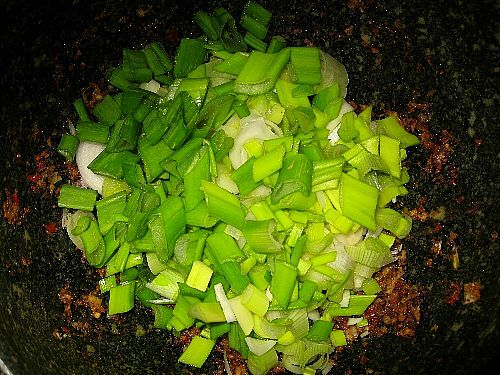 Grind to a paste, then add roughly chopped scallions, including the green part. Make a paste, then add fresh thyme. 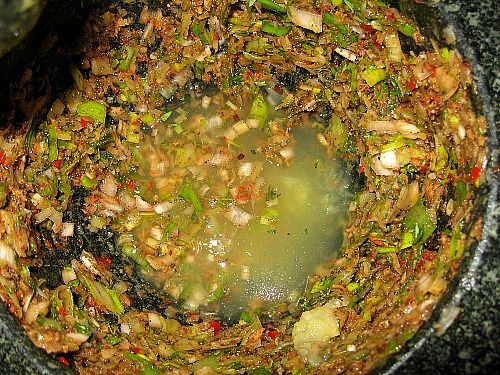 Add enough lemon juice to make a paste. In Jamaica they use vinegar but I think it gives a rotten taste to the meat. You decide. The finished jerk marinade. If you use a blender you will get a smoother result but the color remains rather unappetising I'm afraid. Skin your chickens. Here I used cockerel, very young chickens. 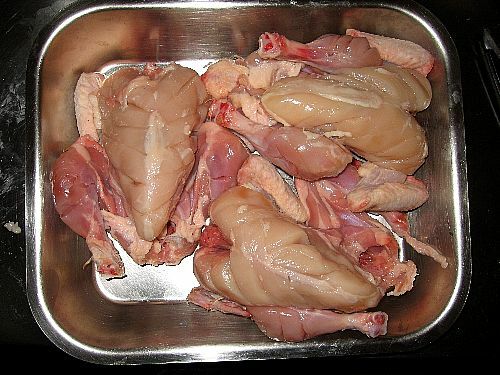 Make deep cuts about an inch apart on breasts and legs to let the marinade penetrate. 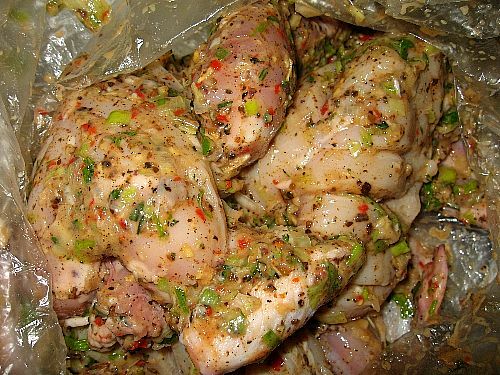 Combine chickens and marinade in a freezer bag and let in the fridge for 3-6 hours. 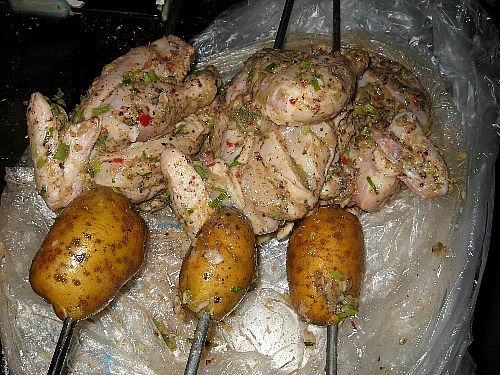 Skewer the chickens on the seekhs and stick a potato below to prevent them from slipping. 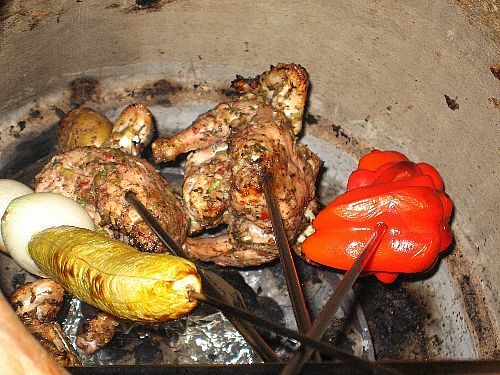 Grill in the tandoor for about 25 minutes with a few plantain, onions and peppers. I had to fish out my peppers from the tray below the tandoor because I was careless enough to omit the potato on that seekh. The result is amazing, delicious, and almost fat free since most of the fat has been removed from the chickens and the marinade does not contain any. But you don't need to be watching your waistline to enjoy this dish, I don't and I did. Looks excellent - but I can't find a clear list of ingredients. hello, I would probably sound heretic to my punjabi friends, but I had pirri-pirri chicken in "ALTE" in Portugal, and I liked it better than tandoori chicken!! Any comments? Hi FX-- Greetings from Boston USA. Love your site! 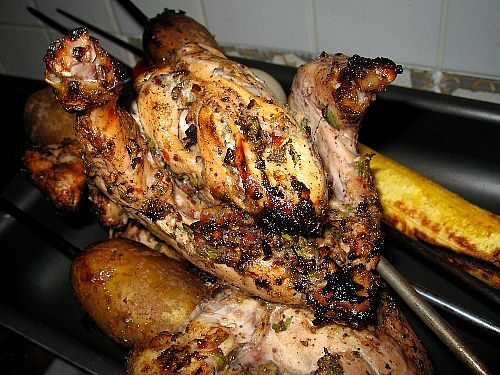 What proportions of spices do you use for the jerk chicken recipe? 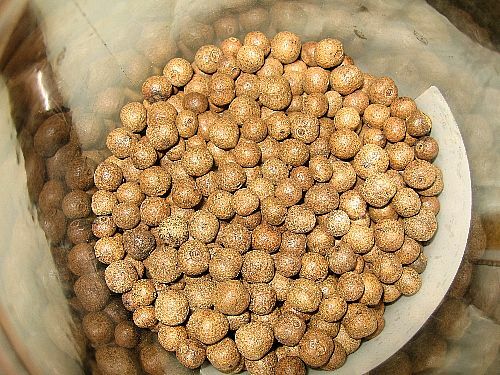 excelente receta me gusto mucho la explicacion y las fotos tengo 2 preguntas 1. con que se puede acompañar de guarnicion este platillo y 2 abra alguna diferencia si en ves de cocerlo en el horno, lo parrille?? espero tu respuesta gracias. Francois, what happened to your blog?? Yours was my absolute favorite, and I miss your posts!! FX's answer→ Thanks Lynne well now I am back! 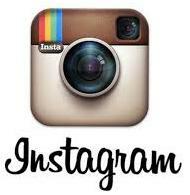 Sorry if you missed my articles! A Julio Lara, creo que una guarnición excelente para este tipo de pollo es el típico arroz blanco cocido con vegetales,para tú segunda pregunta, es muy poca la diferencia en sabor, no importa haces a la parrilla este pollo, en mi opinión, el sabor es mejor cuando es cocinado a la parrilla que horneado, Saludos al equipo de FXcuisine!! !